Lately I’ve been looking a lot at the different ways people get traffic towards their blogs. I’ve been doing this for three years, and feel like I pour a lot of myself into it. I write because I love to write, I love to share things I’ve found. I have opinions and I get to put them out into the world. However, sometimes I put my heart and soul into posts and tumbleweed happens. So, in an attempt to lessen the tumbleweed, I’ve looked into different methods of gaining attention for this little blog. Pinterest has been a big one that I saw mentioned elsewhere, so I’ve been working on it a lot lately. So, what kind of changes have I made? Best to start off with the profile. There’s no point in having perfect boards if your profile doesn’t give any indication as to who you are, or what you’re about. I started with my name. I changed it from Lisa Ryan to Lisa Ryan – BadMammy.com – Parenting and Lifestyle Blogger. This gives a much broader image of what I do, what my account will contain and what people can expect. The pins I put up all have a description as to what they’re likely to link to. Many times you’ll see pins that are perfectly lovely and look great but you haven’t a clue where clicking on that pin will bring you. A description of the post it’s linked to along with keywords will bring it up in more search results. I’ve started using Rich Pins which pulls my Meta Description from my blog post through, making this even easier. Just a note – keywords are good, hashtags not so much, the algorithm doesn’t like them. Save your hashtags for Instagram and Twitter and focus on keywords and key phrases for Pinterest. I’ve started using Tailwind for scheduling pins to go up at optimum times across different boards. Before I did this, I was definitely guilty of spamming my poor feed followers with the same pin over and over as it hit lots of different boards in one go. As well as potentially annoying them, it also meant that it wasn’t spread out. However, going back on multiple times a day to pin to different boards wasn’t worth the time. Tailwind has fixed this for me, I get to do the whole lot in one go, pinning them to different boards (and board groups) at intervals so they’re not spamming and I can forget about them. I started off with a free trial and loved it. While it is paid, you can try it out for free and get $15 off by signing up through this link (another free month). I’d definitely try it out for the free month – what have you got to lose? Tailwind Tribes is also really helping with my reach – basically it’s like a Pinterest pod within Tailwind, sharing posts with others in similar interest fields. I’ve raved about Canva before, and with good reason. It makes my image creation for my blog and social media so much easier. I’m not a big graphic design person, Photoshop terrifies me, so I can attest to this being totally user friendly. Canva is the free version, it’s good, but I found the extras within Canva for Work (having templates and a brand kit that I’ve personalised, adding my own fonts etc) to definitely be worth the monthly fee. They take all the guess work out of the image sizes AND have an incredible Magic Resizer which means that once I’m finished making my perfect Pinterest image, I can then resize it into a general social media image to be shared on Twitter, halving the work. Making all of my images in Canva for Pinterest means that I can do a professional looking job in less than five minutes. I’ve got templates for the main types of image I put up, which I can just change around as needed. It means they look professional and moreso that they look like a cohesive brand. People are more likely to recognise them as being one of my posts from the look of it, which is what everyone wants. There’s no point in making the pretty images if they don’t wind up on Pinterest. But I really don’t like how the long images looked on my blog. I had been ignoring the whole long image thing for a while within posts and just uploading them to Pinterest myself. However, if people were adding posts to their boards, they were then using images that were horizontal – not ideal. So, how to get around it? I found a SUPER easy hack to hide the pinnable images in my posts – they’re invisible until you use the Pinterest Pin It Button, and then they pop up! It’s one tiny piece of code which I copy and paste from my Notes and voila, problem solved. As well as adding my pins to different relevant boards of my own, the way to get them out there has been to share them on group boards. As with everything, it’s important to pick RELEVANT boards that are accepting contributions from others. Most of them have different rules about what they’ll accept, so it’s best to check before you pin! You can find a massive list of Group boards over on PinGroupie – and hopefully find lots of new faces to read your content. 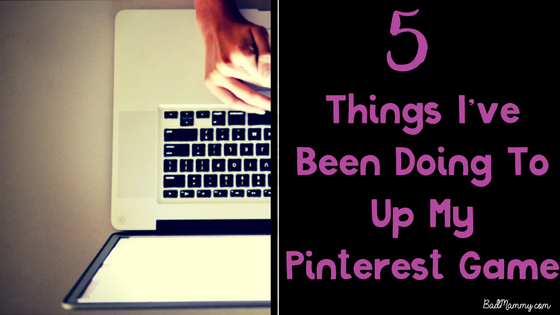 So, those are just five things that I’ve been trying lately and have been seeing a massive increase in my numbers coming over from Pinterest. Is there anything I’ve missed, or that you’d like to know more about in more detail? Let me know in the comments. I need to up mi Pinterest game. I recently began using a pin scheduler. I would love to join a few Pinterest boards. These are all great tips and I 100% affirm them. The past 6 months I’ve been doing the same and it has made a HUGE difference!